Can Cartoons Change the World? I’m still a little shaken from watching the film Race to Nowhere yesterday. I was retelling a scene to someone and started getting all worked up again. Thankfully, this TED talk came along today, which tries (in 6 minutes) to teach us how we might change the world one laugh at a time. We have to make sure we nurture kids’ sense of humor and visual skills. The American Library Association announced this year’s winners for the Caldecott (illustrator) and Newbery (author) awards for children’s literature. The book A Sick Day for Amos McGee which I posted about last week, won the Caldecott. Sometimes books can be simple and sweet without the harsher realities of the world and offer children a nice escape into a world where everyone is kind to one another. If you follow this blog, you know I really enjoyed it, but I thought David Weisner’s Art and Max was a little better. Of course, Weisner has already won 3 Caldecott Medals, so maybe they decided to skip him this year. I wouldn’t be surprised if we see him again soon. What was a pleasant surprise was the Laura Ingalls Wilder award. The Wilder Award honors an author or illustrator whose books, published in the United States, have made, over a period of years, a substantial and lasting contribution to literature for children, and this year’s winner was Tomie dePaola; it’s a fine coincidence that second grade is currently involved in a dePaola author study. It’s often quite exciting to observe children when they have a close connection to current events. Below are a few of dePaola’s better known titles. Another author/illustrator known for simple and sweet. I haven’t read this year’s Newbery winner Moon Over Manifest, but it sounds good, and perhaps I should grab a copy. Hopefully it’s as good as the last two winners. What is fluency? Is it simply reading quickly and accurately, or does a fluent reader also need to read with expression as well as comprehend what is read? Interestingly enough, a more recent definition (Good and Kaminski, 2002) has left out both expression AND comprehension! You know a book is a good book when it makes you think about how you teach and why you do what you do. In Richard L. Alliongton’s book What Really Matters in Fluency: Research-Based Practices Across the Curriculum, he addresses those same questions I posed, and yes, fluency should include expression and comprehension. The stress now is placed on the second word. A fluent reader would know this and place the stress on the correct word whether speaking or reading. What the author worries about is that many teachers are in fact not teaching fluency skills. The kind of expression needed in order to convey meaning. Like the way we talk. One of the most important strategies for reading fluency is reading aloud to children so that you model good fluency. Just imagine those who enter Kindergarden and have been read to every night vs. those who have not had that same opportunity. The gap between the amount of words, phrases, sentences heard (even if the child cannot really read by then) is in the millions. Another strategy is making sure kids read appropriate texts. They need texts where they feel successful in order to foster fluency development. Accuracy is also very important. Children need to develop “at-a-glance” recognition, also called automaticity with many of the words they read. Kids who have trouble reading often do so with the little words both in meaning and their orthographic similarities (of, off, if; where, were, there). When was the last time you asked a child to define the word “of”? As mentioned, reading volume. The more they read or are read to, the better. One suggestion in getting struggling readers to read more, is by pairing them with reading to younger developing readers. Repeated readings is also a strategy that works, but there are caveats, one being that it limits the opportunities of the child from experiencing unique texts. Do not interrupt a reader when he/she is stuck on a word. One should pause, then provide a prompt if needed, and then praise the effort. Too often teachers interrupt the struggling reader too soon. In second grade, we teach our students to do this as well when partner reading. Have students engage in Free Voluntary Reading or other sustained silent reading times. Be careful of basal readers or anthologies – often the range in reading difficulties is so great. The author found a third grade anthology with texts ranging from 2nd grade reading levels to those of a 6th grade text. A teacher should not assume that the publishers have done their job in vetting the stories for reading levels. Finally, what I found most interesting in this book is the author’s disdain for the assessment tool called DIBELS (Dynamic Indicators of Basic Early Literacy Skills). Each subtests calls itself a fluency test, but all it is measuring is the rate and accuracy of reading with no regard to comprehension or prosody. Often children read for speed, score well, but don’t comprehend a thing they have read and are given texts that are inappropriately too hard for them. Others may fall in the “at risk” factor based on this assessment because they are reading slowly and carefully, but they read with more expression and understand what they have read. Unfortunately many of these students across the country are also given the wrong texts. Why do I find this interesting? This author devoted a whole chapter to assessing fluency, half of that chapter, he spent dismissing the reliability of DIBELS as an assessment of fluency. Our school uses it as one measure. It’s validating, though, that we take a lot of other things into account, many of which are mentioned in this book and use multiple assessment strategies as well, but if DIBELS is really all that unreliable, should we be using it at all? In the end, I couldn’t agree with the author more, that both reading aloud to students and reading volume is important. It goes with the persistent practice theories mentioned in The Talent Code and other similar books. Kids need opportunities to read, at school, at home, wherever. My only complaint of this book is the $37 price tag for a 138 page paperback. Thank goodness it was left in the teachers lounge on Friday to be passed on, where it will return tomorrow for someone else to read. Thought provoking and written in a style that is easy for teachers to read, the book also offers many strategies for fostering fluent readers. I sometimes find that my own perceived strengths in certain contexts can also be my weaknesses in others. For example, when I’m teaching, I think that one of my strong traits is patience. However, outside that arena, I can be extremely impatient. Educational reform, for example – Why hasn’t it already happened? For me, the same contradiction applies to giving presentations. Years ago, when I sang in a chorus, I enjoyed getting a solo, and it didn’t matter what the size of the audience was, it wasn’t something I feared. I currently have no problem getting in front of my students when I need to present something to them. Still, public speaking in front of adults has always intimidated me. Whether it be for a parent curriculum night or presenting something I’ve learned to other faculty members, it is not something I have a lot of confidence in. I have learned, though, that one can only get better at something by practicing, and one learns from their errors. So, when asked to give a presentation today about using and integrating technology in the classroom, I said, “Yes,” but was rather intimidated by the idea. After all – what do I know? I’m still learning about it myself. But like my own fears in the areas mentioned above, I know that using technology can be something a lot of teachers find intimidating themselves. With that knowledge, my goal was to hopefully demonstrate some of the possibilities with the tools that we have, so that they can be used to engage kids in meaningful ways – as well as make some of my audience feel like they had the capacity to get outside their comfort zone, take risks, and in the process – learn. I think I watch too many expert presenters – whether at conferences, or through TED talks and my expectations for presentations has risen. A few good examples of who I was lucky enough to hear in person last year include John Medina, Sir Ken Robinson, Michael Sandel, and Carol Dweck. Watching these presenters is a good way to learn, but you still need to do it for yourself in order to get the practice. Over the break, I read a great book called Resonate: Present Visual Stories that Transform Audiences. I have to say that this book influenced me a lot on how I went about putting my presentation together. Here are just a few things I learned from the book: Tell a story with your audience as the protagonist. Define the journey and where you want to take them acknowledging the risk and resistance. Make the reward worth it. Value brevity and understand there is always room to improve. Use evocative visuals. And so, for my presentation, one of my first slides was an image of the spaceship USS Enterprise, and I started by stating Star Trek’s Mission: To boldly go where no one has gone before. Followed by a Maslow quote: “We are not in a position in which we have nothing to work with. We already have capacities, talents, directions, missions, and callings.” I then went straight to an image of the USS Lincoln with the infamous “Mission Accomplished” banner, letting my audience know that we can avoid this if we focused on our own mission. What flashed up next on the screen was my school’s Mission Statement. It’s something that hopefully made a connection with everyone that was in the room. Only then, did I state my objectives for the hour to come and continue with my presentation. Opening that way is not something I would have normally done had I not read the book or seen great speakers, but it was a great learning experience for me and upon reflection, worth taking the risk. I’m hoping I influenced my colleages just enough so that they will also take some risks in trying to use some of that technology. Below is the author of the book mentioned above giving a quick summary of why it’s important to engage through story. One of my goals this year is learn more about gardening. My kids have a garden journal and I’ve decided to blog every time they make an entry. Descpite 14 degree weather, the green fertilizer we planted continues to grow. I learned that because it snowed first, the snow acted as an insulator and therefore there was no frost. This might not be math the way text books teach it (which tend to be linearly), but it certainly makes math meaningful to children because it’s tangible and kids can relate to it. I haven’t told the kids yet, but there’s a literature tie-in too. Later in the year, we do a unit on Greek myths and they will be able to relate to the story of Echo and Narcissus. 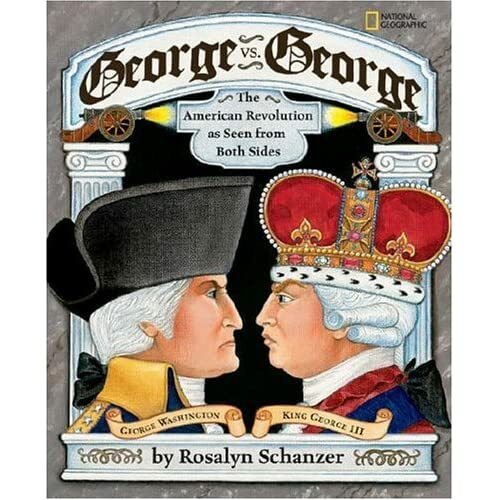 There’s a great picture book (yes, it’s a picture book) on the revolutionary war titled George Vs. George and it attempts to describe the events from two perspectives: that of the British, and that of the Colonists. 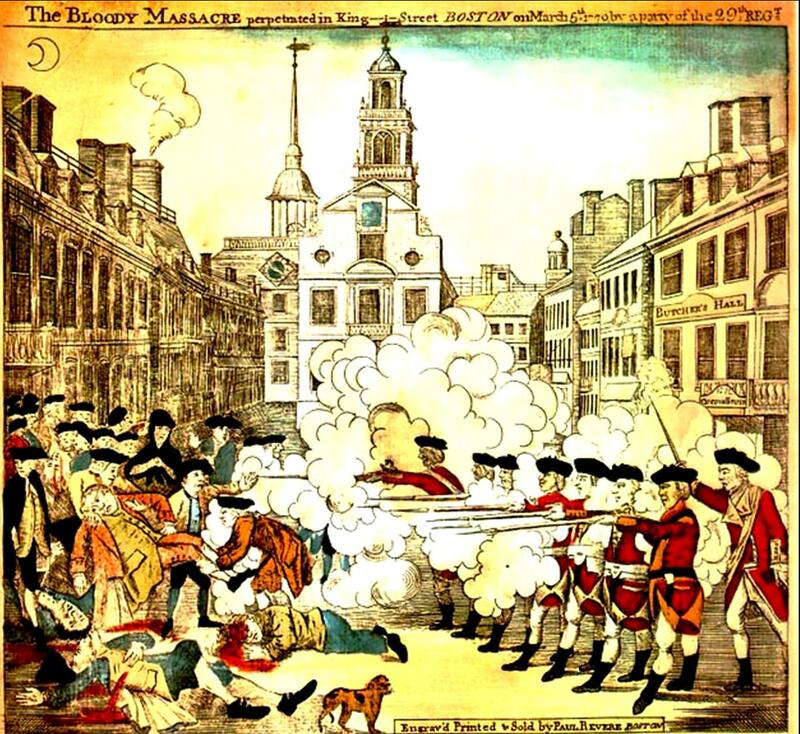 Last Friday, after the children read two different accounts of the event and viewed a 4 minute online video, they were asked to examine Paul Revere’s illustration below. During our discussion the following questions were asked: Who looks innocent in this picture? One of the men killed, Crispus Attucks, was an African American, yet he is not portrayed here – why do you think that is? The British soldiers are all standing in a straight line with their weapons all aimed the same way. Did the illustration match the descriptions you read? Why or why not? With todays image rich world, it’s important for kids (yes, even 2nd graders) to be able to analyze, think critically, and discern for themselves what’s going on beyond the story. The children looked up the words ‘massacre’ and ‘riot’ and they had to decide for themselves if one word fit the situation better based on the multiple sources they were exposed to. Before giving the children the title of the piece, we asked them what they thought they saw. Some mentioned color. Other’s mentioned shape (we threw in some math terms where we could). A few mentioned texture. I told them that this hangs on a wall and we may see it on our visit. 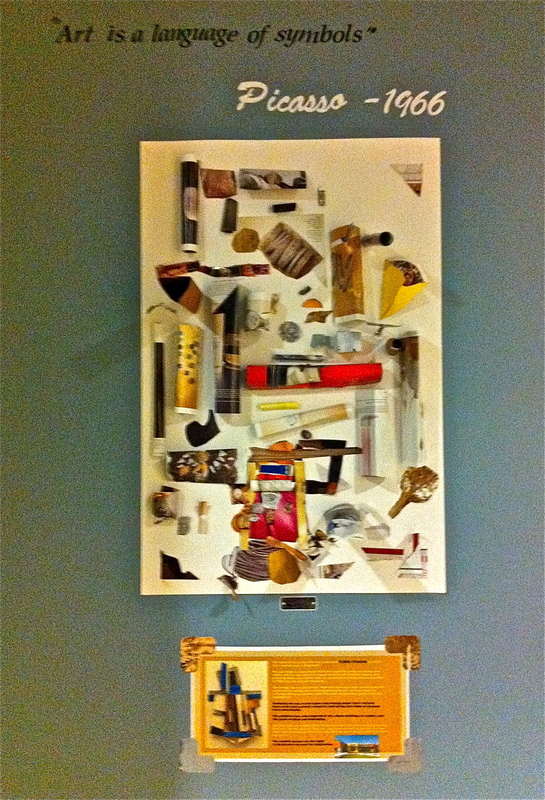 We then discussed whether they thought this was a painting or a sculpture – or both. We then told them the title of the piece was Violin and asked them if they saw any elements of a violin. We then showed them an image of our new school and asked them to deconstruct it and build shapes that reminded them of our school building. When we first thought of taking a field trip to the exhibit, we thought it would be an excellent opportunity, but didn’t really see how it fit into the curriculum or our schoolwide theme of sustainability. Nonetheless, we discovered that using recycled magazines and using the school as the subject, we fulfilled two of the three subtopics of that theme: sense of place, and reduction of paper. Our objectives also included collaboration and the sharing of ideas. 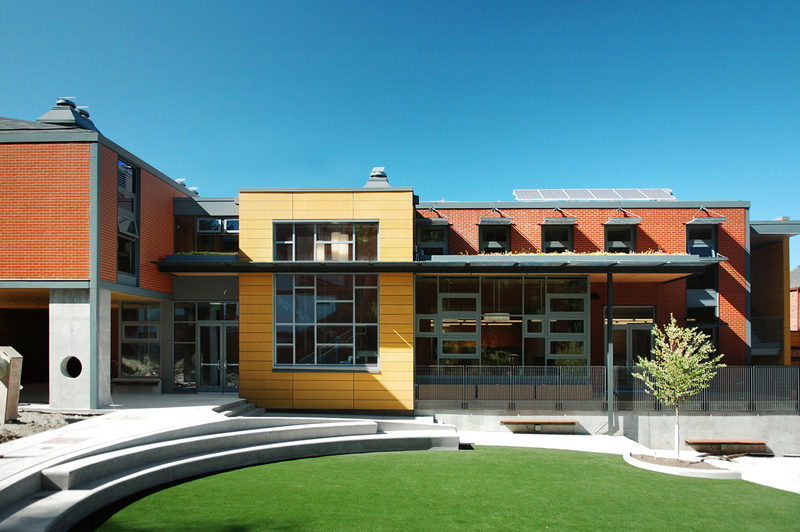 If you look closely, you might see elements of a solar panel, native plants, a green roof, and a sundial. 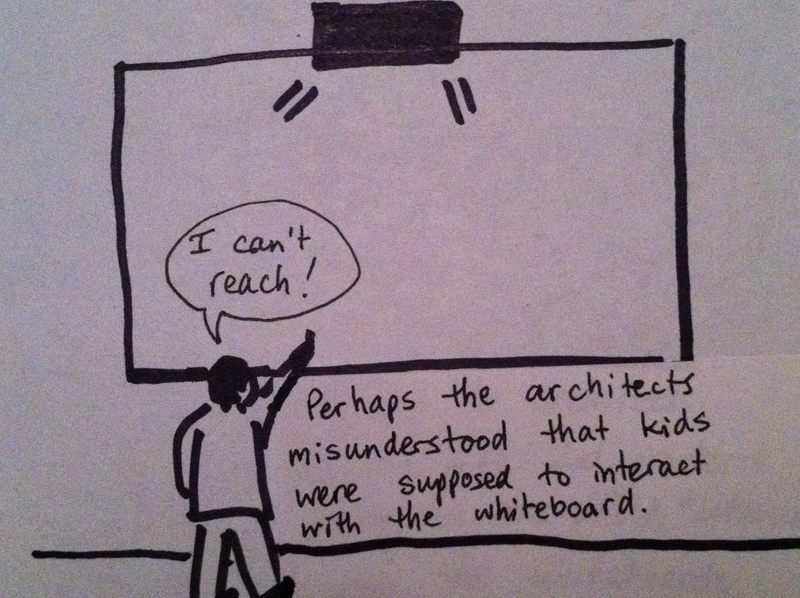 Whether it be a history lesson, or an art lesson, seeing things from multiple perspectives often leads to new insights both for the kids and the teachers.